This article was written by Ellery Roberts Biddle and Filip Stojanovski, a staff member at the Metamorphosis Foundation. Just over one year ago, the Macedonian government launched a campaign of “de-Sorosization”  of Macedonian civil society groups. What did they mean by “de-Sorosization, exactly? The campaign sought to undermine the work of local organizations associated with the philanthropic foundation of billionaire George Soros, along with other western institutions such as the US Agency for International Development (USAID). The campaign was led by former Prime Minister Nikola Gruevski  of the (formerly ruling) VMRO-DPMNE party. VMRO was notorious for its politically-motivated investigations of CSOs and independent media seeking to raise public awareness about government spending and corruption. Like in Hungary  and other European states with authoritarian tendencies, conspiracy theories demonizing Soros  and western institutions such as the EU and NATO became a mainstay of VMRO government propaganda. Fani Karanfilova-Panovska. Photo by Vančo Džambaski (CC BY-NC-SA 2.0). The campaign launched shortly after special elections  in Macedonia, which were held as part of an agreement brokered by the EU, following massive public protests over revelations of a government wiretapping scandal that affected thousands citizens. The ruling party lost its majority in the special election, but it was not until late May 2017 that a new government was officially handed power. In a conversation with Global Voices, Fani Karanfilova-Panovska, who is the executive director of the Foundation Open Society – Macedonia , suggested that the Gruevski government and ruling party targeted CSOs because civil society had been “the chief driver of changes and progress” in Macedonia from 2014 to the present. Editor's note: Global Voices is a grantee of the Open Society Foundations, which are part of the Soros network. At the start of his “de-Sorosization” campaign in December 2016, Gruevski called for a “showdown” with CSOs cooperating with Soros’ foundation and foreign government aid organizations. He argued that rather than seeking support from outside of Macedonia, the country's civil sector should instead rely on the Macedonian government for financial support. This proposal would have made CSOs entirely dependent on the government, an idea that undercuts the very essence of many a civil society organization, which is to maintain independence from the government in order to best hold it to account for its commitments to the public. To support Gruevski's proposal, government surrogates in the media promoted the notion that civil society should be about charity or humanitarian aid, and that it should not be involved with civic engagement, anti-corruption, media or any activity related to political decision-making. Some civil society activists also commented via social media that that they would decline financial support from the government in their jurisdiction, in order to maintain accountability to the public. 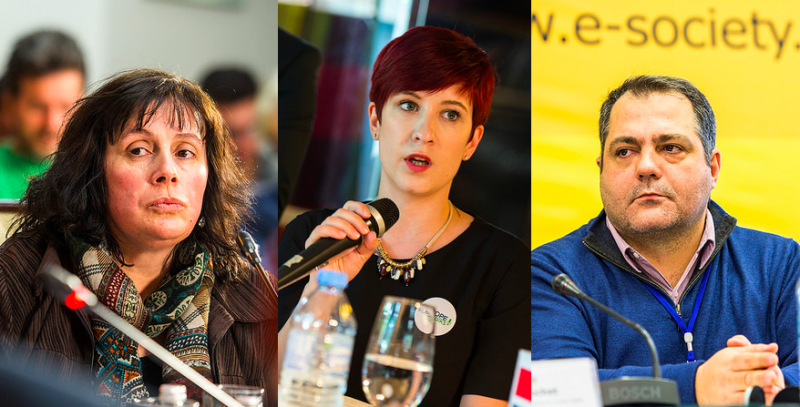 For CSOs that had experienced direct persecution from the Gruevski government, it was difficult to imagine receiving any support at all. On the other hand, those eager to prove their loyalty to the ruling party had a quick reward in store. Certain CSOs benefitted from this structure, as some state funds were used to support sports clubs, as well as service-based organizations established during socialism like associations of people with disabilities or retired persons, who account for a large voting bloc. Other state funds were siphoned to the ruling party interests via Government Organized NGOs (GONGOs) , for instance for building monuments from the Skopje 2014 project  or financing a spate of self-declared “patriotic” organizations  founded by party members. But other CSOs suffered under this regime. In February 2017, state institutions expanded a series of inspections and financial audits of CSOs. In particular, they targeted 21 CSOs that had participated in a pre-election civil campaign “We decide” , which sought to improve public understanding of the electoral system and rules, given that a large percentage of Macedonian citizens  believed that their ballots are not secret, and that political parties can find out how they've voted. State inquiries targeted one donor specifically, which was not connected to the “We decide” action: the US Agency for International Development or USAID , which over the last 25 years has supported large capacity building initiatives for civil society and independent media. The common thread in selection of targets seems to be the failure of previous government attempts to subvert them to its political agenda – what the government couldn't control appeared to be slated for removal from the country. These anti-civil society activities in Macedonia were synchronized with lobbying efforts in Washington D.C. , aimed at sowing discord between the USAID, the State Department and the Trump administration. These and other forms of institutional harassment virtually blocked the work of CSOs, draining their resources . Unofficial parts of the campaign included various other kinds of attacks, from defamation to intimidation and hate speech  to physical violence  against activists and journalists. In tandem with Gruevski’s announcement about using government resources to support CSOs, in March 2017 the government issued a call  offering CSO grants in total amount of 800.000 euros. This came as a surprise because this amount was not allocated in the 2017 state budget. With an exception of one humanitarian CSO, these grants were distributed through an unusually speedy procedure, mainly to new organizations with direct connections to the ruling party. The new government annulled the call and announced a corruption investigation. After a failed attempt by the VMRO to take control of Parliament by force on April 28, 2017, the duress subsided. Most of the CSOs received final documents from the Public Revenue Service during the following months. Some of these included fines, which most have contested because they are based on individual interpretations of dubious legislation. At a May 2017 public conference  on anti-corruption, a representative of the State Commission for Prevention of Corruption was asked about the investigations against CSOs. He acknowledged that the Commission initiated the “de-Sorosisation” controls involving coordinated action — allegedly directed by party leaders — of institutions including the National Bank and the Public Revenue Service (both of which imposed financial audits on CSOs) and the Public Prosecutor’s Office (PPO) for Organized Crime and Corruption. The PPO also engaged the Organized Crime Unit of the Ministry of Interior, and the Financial Police, a subsidiary of the Ministry of Finance. Although this effort began before the December 2016 elections, the Commission omitted it from their annual report which they submit to parliament. The parliament later rejected the report on these and other grounds. An ambassador of large institution came to us and asked why we initiated control of the work of the civic organizations. [He said] ‘Only their donor can conduct controls’ in their country. And I replied – but what if the donor is (laughs) a terrorist organization? Tanturovski, who was a VMRO-DPMNE donor in 2012 , was appointed to the Commission in spite of the law that requires that its members to be independent of any political party connections. Despite numerous scandals and publicly available information, Tanturovski did not initiate a single investigation of ruling politicians’ corruption during his tenure. In a charged anti-Western  atmosphere promoted by pro-government media , his attempt to portray Soros and USAID, and by extension the US government, as terrorist-supporting organizations received no reaction from other officials. Политичкиот прогон на граѓанските организации осмислен и спроведен од владата на ВМРО-ДПМНЕ мора да биде, што е можно побрзо, комплетно расветлен, официјално затворен и јавно осуден од страна на актуелната власт и надлежните државни институции. Сите вклучени лица и институции треба да одговараат за своето незаконско дејствување. Само на таков начин, граѓаните ќе добијат поттик и јасна порака дека Македонија е отворено, демократско општество кое ги почитува и штити основните граѓански права и слободи. Political persecution of the civil society organizations, which was planned and implemented by the government of VMRO-DPMNE must be completely exposed, officially closed, and publicly condemned by the current government and the relevant state institutions ASAP. All involved persons and institutions must be held responsible for their illegal actions. Only in this way the citizens would get an incentive and clear message that Macedonia is an open, democratic society which respects and protects the fundamental civil rights and liberties. At the end of August, the chief state prosecutor, who is known for granting impunity to organized crime groups in the country, was sacked by the parliament, giving CSOs hope that things would begin to change. 132. Civil society organisations have also reported harassment and inspections from authorities such as the Public Revenue Office and the Public Prosecutor's Office from December 2016 to May 2017. While civil society organisations must comply with relevant legislation, the group finds this development alarming. The group expects the relevant authorities to conclude their investigations speedily in order to avoid that cases without actual merit stay pending for months, contributing to chilling effects upon other civil society organisations. In November, the Minister of Interior gave a public statement  investigations had concluded, and that no evidence of wrongdoing on the part of the CSOs had been found. However, by mid-December the CSOs had not yet received official documents that would provide legal closure. This long campaign of political prosecution has severely affected the work, resources and reputation of the civil society in Macedonia. The campaign to frame them as criminals and traitors followed patterns tested in other countries in the region, with government actions similar to those in Russia or Hungary. Macedonian activists are attempting to draw lessons from their predicament, that might be helpful to other societies facing similar challenges. Граѓанските организации изложени на хостилен исцрпувачки притисок од институциите на владиниот режим во Македонија покажаа дека и покрај се’ демократскиот напредок е на прво место за невладините организации. Во најтешките периоди на своето постоење граѓанските организации ги дадоа најзначајните политички документи и препораки за институциите и имаа клучна улога во надминувањето на политичката криза во Македонија. Слободите на граѓаните за здружување и изразување се под закана од автократски режими во повеќе земји, и за негово опстојување граѓаните мора да си даваат меѓусебна поддршка но и да да ја добијат од медиумите, демократските влади и меѓународните организации. 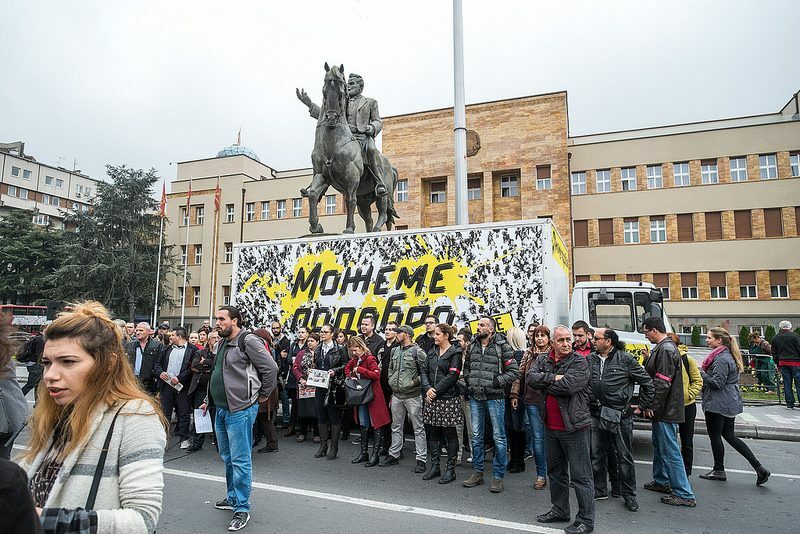 Civil society organizations which were exposed to hostile and exhausting pressure by the institutions controlled by the government regime in Macedonia showed that in spite of everything, democratic progress is a priority to CSOs. During the hardest periods of their existence CSOs produced the most significant policy documents and recommendations for the institutions, and had a key role in overcoming the political crisis in Macedonia. Freedoms of association and expression are under threat by autocratic regimes in a number of countries, and to uphold them citizens must provide mutual support, but also require support from the media, democratic governments and international organizations. Како резултат на политичкиот прогон на сите нивоа, заедно со интензивната кампања за нарушување на угледот преку навреди и клевети, беше нарушен имиџот на граѓанското општество како целина. Ќе бидат потребни големи напори и време тој имиџ да заздрави и да се реафирмира нормалната улога на НВО како витален дел од демократското општеството. This campaign for political persecution at all levels, paralleled with an intensive smearing campaign, severely damaged the image of the civil society as a whole. It will take a lot of effort and time for this image to recover and the NGOs to reaffirm their normal role as a vital part of democratic society. The change of political atmosphere in Macedonia doesn't imply that all problems of civil society and independent media will be solved easily. Under the new government, if the judiciary and law enforcement are reformed and provide appropriate closure to this period of political persecution, they will still have to face a dismal economic reality and other hostile influences stemming from political conflicts both within and outside of the country. 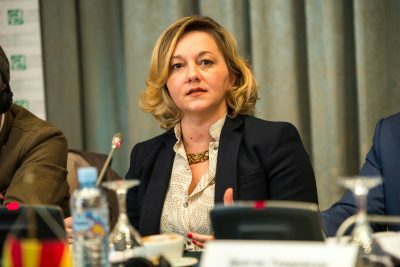 While there is still a glimmer of hope that Macedonia may one day become part of the EU, CSOs stress that one of the important challenges is to educate citizens so that they may fully exercise their role as decision-makers in a modern democratic society and hold their governments to account — regardless of who is in power.